the 1st day of his birth (7-9-98). To make a long story short, he was finally diagnosed at 5 days old at Riley Children’s Hospital in Indianapolis, Indiana. We have a really great group of people who manage Brandon that include Dr.s Wappner and Hainline and a great dietician Becky who I consider my friend. Without them I really don’t know where Brandon would be today. Brandon has a g-tube and gets almost all of his nutrition through his tube. He does eat by mouth and that mostly consists of Quakes (ranch flavored), and puffed popped corn. Brandon also likes sauces and will usually try anything like that. Now that is enough about the medical stuff. Let me really tell you about my son Brandon. He is 6 (almost 7). He will be entering 1st grade in a special education class. He has conquered his ABC’s and will soon have his numbers 1-10 down. 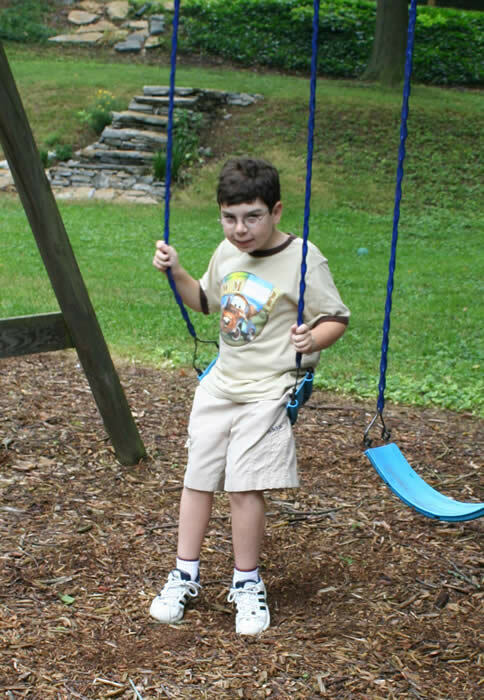 Brandon loves to play outside and really enjoys being around other kids. He swims with Special Olympics, plays baseball on a Challenger league and can ride his bike with training wheels. Brandon has shown great promise with his vocalizations and with practice I know someday I will hear “I love you Mom.” Brandon has a smile that can melt your heart, but also has the mischievous twinkle in his eye. I know I have been truly blessed. We love you Brandon, keep up the good work. Tony, Lisa, Matt and Brandon N.